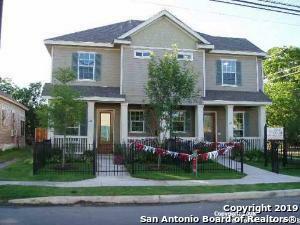 All BROWNSTONE homes currently listed for sale in San Antonio as of 04/20/2019 are shown below. You can change the search criteria at any time by pressing the 'Change Search' button below. "ALL APPLIANCES INCLUDED! Meticulously maintained two story open living town home near The Pearl, St. Mary's St. and The River. Two master bedrooms. Lot's of closet space. Wood floors on main areas and kitchen. Custom tall spacious kitchen cabinets, granite counter tops. Hardly used refrigerator and washer & dryer all included. Water softener connection. Nice shaded front porch entrance with mature trees. Wrought iron fence in front yard and privacy fence in back. Only two units on a cor"